Embolic agents used for SAE have included Gelfoam, coils, and vascular plugs., Most embolic agents, such as coils and vascular plugs are permanent. However, Gelfoam (Upjohn Co., Kalamazoo MI, USA) is a temporary embolic agent that has multiple unique properties making it a desirable choice for the management of splenic injury. Gelfoam provides temporary scaffolding for clot formation and allows for vessel recannulation and reperfusion in a few weeks, preventing necrosis or atrophy due to permanent occlusion. Additional advantages of Gelfoam include low cost, versatility, and extensive clinical use. The decision to use permanent or temporary embolic agents during SAE for blunt splenic injury vary based on the interventionalist's preference, experience, and available resources. The primary aim of this study is to retrospectively examine the use and outcomes of Gelfoam SAE in adult patients with blunt splenic injury at a single center. All adult patients with blunt splenic injury admitted to a Level 1 trauma center from January 2014 to December 2015 were retrospectively identified from the trauma registry. Patients who died before Gelfoam SAE were eliminated from the study population if the death occurred before the embolization. Data were collected on 132 patients from the trauma registry and the patient's electronic medical records. Approval from the Institutional Review Board was obtained before data collection. Angiography and Gelfoam SAE were performed by an interventional radiologist for patients with blunt splenic injury who had active extravasation on CT and clinical signs of active bleeding. The decision to perform Gelfoam SAE was based on the interventionist's preference as the facility does not have a written protocol guiding the use of embolic agents. Patients who did not receive Gelfoam intervention were treated by the standard hospital protocol supporting the 2013 EAST guidelines. The common femoral artery was accessed with a micropuncture needle, and a vascular sheath was placed. Splenic artery access was obtained using a five French catheter and further selected with a microcatheter and microwire. Splenic angiography was performed followed by Gelfoam SAE until satisfactory stasis was achieved. During retrospective review of radiologic reports and angiographic images, an interventional radiologist recorded the site of SAE (proximal, middle, or distal splenic artery). Complications related to Gelfoam SAE were recorded from the trauma database and patient's medical record. Statistical analysis included descriptives, ANOVA, and nonparametric tests as appropriate. A P ≤ 0.05 was considered statistically significant. All data were analyzed using the Statistical Package for the Social Sciences, version 23.0 (IBM SPSS Statistics for Windows, Armonk, NY: IBM Corp). 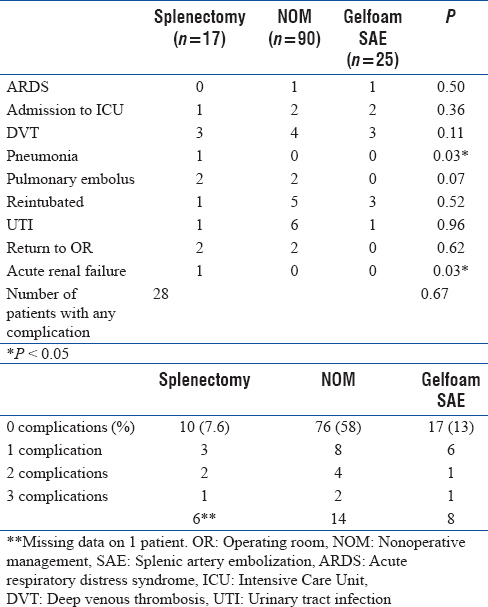 Demographics, injury characteristics, and outcomes comparing the patients who received Gelfoam SAE, NOM, and splenectomy are provided in [Table 1]. A three-group design was used based on the following intervention received: splenectomy, NOM, and Gelfoam SAE. Gelfoam SAE was performed in 25 (18.9%) of the possible 132 patients. Three patients in the Gelfoam SAE had missing information. The splenectomy patients comprised 12.8% of the total study group, while the NOM was 68. 1%. The average age of the patients who received Gelfoam SAE was 35.6 years (+13.1) compared to the average age of the splenectomy was 32 years (+11) and NOM was 41.8 years (+18.6). The average Injury Severity Score (ISS) for the Gelfoam SAE was 33.4 (+11.6) compared to those with a splenectomy was 37.4 (+13.2) and NOM was 24.7 (+9.9). The splenic grade for the Gelfoam intervention was 2.96 (+1.2) compared to 1.68 (±0.69) in the NOM and 3.73 (±1.4) in the splenectomy group. The Gelfoam SAE group had 8.2 (+7.1) Intensive Care Unit (ICU) days compared to 8.9 (+9.0) in the NOM and 15.8 (+16.1) ICU days in the splenectomy group. The descriptive statistics are shown in [Table 1]. Using ANOVA, an association between patients who underwent Gelfoam SAE and specific risk factors is shown in [Table 1]. The model contained five independent variables which were statistically significant in the univariate analysis (ISS, hospital days, ICU days, splenic injury grade, and administration of blood products). The results demonstrate a statistical difference overall between patients that received Gelfoam SAE and either splenectomy or NOM in ISS (P < 0.01), spleen grade (P < 0.01), blood products (P < 0.01), and ICU days (P < 0.05). However, it was no statistical difference in use of blood products and ISS grade between Gelfoam SAE and splenectomy groups. ICU days were statistically different in the splenectomy group but not the Gelfoam SAE and NOM groups. All groups were statistically different in spleen grade. We next assessed the impact of a number of factors on the use of Gelfoam embolization in the sample population. Complications of Gelfoam embolization, which was defined as any additional factors that contributed to the patient's overall length of hospital stay, were identified and retrieved from the trauma database and the patient's electronic medical records. Overall, 103 of 132 patients (78%) had no complications. Data were missing on one patient. Complications were coded as the following: no complications or one, two, or three complications for each of the three groups. Identified complications consisted of acute respiratory distress syndrome (ARDS), readmission to the ICU, deep venous thrombosis (DVT), pneumonia, pulmonary embolism, reintubation, urinary tract infection (UTI), return to the OR, and acute renal failure. Twenty-eight of all the 132 patients had complications which yielded an overall complication rate of 21.2%. As identified in [Table 2], the splenectomy group had significantly higher rate of pneumonia and acute renal failure compared to the NOM and Gelfoam SAE groups. The total number of complications in each group was compared. Of all reported complications, the NOM group had 16% followed by Gelfoam SAE with 32% and splenectomy group with 35%. When all complications were compared within the ANOVA, there was not statistical significance between the three groups (P = 0.87). Of the 25 patients who received Gelfoam SAE, data were missing on three patients concerning location of embolization (proximal, middle, or distal). The Gelfoam SAE approach was completed proximally in 1 of 22 patients (4.5%), medially in 4 of 22 patients (18.2%), and distally in 17 of the 22 patients (77.3%), respectively. These numbers were too small to draw any conclusions about the possible effects or complications of embolization location. A three French microcatheter was used in 17 of the patients (77%). Four of the patients (23%) received gentamicin sulfate during the Gelfoam SAE. One patient received cefazolin (Ancef). There are numerous studies that support angiography and embolization in improving the success of NOM of blunt splenic injuries and is dependent on the grading of the injury, the ISS, patient age, the presence of contrast blush on CT, activate extravasation on angiography, need for transfusion, the presence of hemoperitoneum, and presence of splenic artery pseudoaneurysms., The current study analyzed the use of Gelfoam SAE for blunt trauma patients. Gelfoam SAE was performed on 25 of the 132 patients (18.9%) of the study population. Splenectomy was used in 17 of the 132 patients (12.8%) in the study population. NOM, defined as those that did not require a splenectomy, was conducted on 90 of the 132 patients (68%) of the total study population. The rate of NOM of splenic trauma in our sample population is consistent with the literature. Van der Cruyssen and Manzelli found that 60%–80% of splenic injuries are managed without surgery. Management of higher grade splenic injury remains a challenging issue in patient care and research. Velmahos et al. (2010) showed that 34.5% of Grade IV injuries and 60% of Grade V injuries fail NOM. Controversy of Grade III injuries and higher has been cited in the literature. The splenic grade for the Gelfoam intervention was 2.96 (+1.2) compared to 1.68 (+.69) in the NOM and 3.73 (+1.4) in the splenectomy group. Three patients in our study who underwent Gelfoam SAE also required a splenectomy. One of the aforementioned patients had a Grade II splenic injury, received Gelfoam SAE, and was discharged 3 days later. After 45 days, the same patient developed a splenic cyst and had a splenectomy. Another patient in the NOM group had a Grade III splenic injury with a spontaneous rupture and required a splenectomy within 24 h of admission. The results of this study show that Gelfoam SAE was performed on patients with different patient characteristics. Gelfoam embolization was performed on patients with slightly higher ISS (33.4 + 11.6) than those in the NOM group (24.7 + 9.9) but less than the splenectomy group (37.4 + 13.2). ISS is calculated by use of anatomical scoring system and used to assess trauma severity. The scoring system is based on six body regions (head or neck, face, chest, abdomen or pelvic girdle, extremity, and external). ISS scores range from 1 to 75. A major trauma or polytrauma is associated with an ISS > 15. This could have attributed to the splenectomies occurring in the patients with a higher ISS. The average age of the patients who received Gelfoam (35.6 years + 13.1) was slightly higher when compared to the average age of patients undergoing splenectomy (32 years + 11.1) and less than the patients treated with NOM (41.8 + 18.6). Complications defined as any factors leading to an increase in hospital length of stay were identified from the study. According to the 2013 EAST guidelines, the literature examined to update the clinical practice guidelines found inconsistency of the complications cited in the studies reviewed. We did not follow-up on the patients' posthospitalization to assess for complications cited in the literature which include thrombocytosis, postsplenectomy infections (OPSIs), abdominal abscess, and overwhelming OPSI. Ekeh et al. examined major and minor complications of SAE over 11 years. Major complications were splenic infarction, abscess, contrast-induced insufficiency, and splenic cyst. Minor complications from SAE were pleural effusion, coil migration, and fevers. Complications of angiography and embolization occur in 20% of patients and include failure to control bleeding, missed injuries, and splenic abscesses. We identified the following complications in our study as it relates to an increase in hospitalization length: ARDS, admission to ICU, DVT, pneumonia, PE, reintubation, UTI, return to operating room, and acute renal failure. Success was, therefore, defined by any patient who did not develop the aforementioned complications. Overall, 78% of the three groups did not develop any complications. The NOM group had fewer complications with a success rate of 57.5% followed by the Gelfoam group of 12.8% and the splenectomy group with 7.5%. The patients who underwent Gelfoam SAE had a fewer hospital days (14.4 + 10.5) than the splenectomy patients (23 + 20.5). The Gelfoam intervention group was in the ICU (8.2 + 7.1) fewer days that the NOM (8.9 + 9.0) and the splenectomy patients (15.8 + 16.1). The Gelfoam patients required more blood products (80%) than the other two groups (NOM 38.9% and splenectomy 94.1%). There was not statistical difference in the use of blood products between the Gelfoam SAE and splenectomy group. The systematic review and data analysis study by Schnüriger et al. assessed the impact of varying techniques on outcomes after angioembolization. Fifteen studies were used in the analysis. Most of the studies used coils and gelatin particles. Complications, as reported from the studies, were categorized by major or minor complications. The authors discussed that more studies were excluded because of the lack of detailed information regarding complications. Major complications were classified as either a splenectomy or splenorrhaphy, while minor complications were identified as rebleeding, infarction, or infection. The review also identified differences among interventional radiologist's discretion using proximal and distal embolization. Proximal embolization was performed more frequently in the analysis and yielded more infectious complications by three different investigators. Distal embolization had no major infections identified. The overall failure rate did not differ statistically between distal and proximal embolization in the systematic review. Embolization techniques were also analyzed in blunt splenic injury and identified no difference in success rates of patients who received proximal or distal embolization. Adverse effects were present in 65% of the patient study. Ekeh et al. 2013 found that distal embolization was associated with more major complications. In our study, 17 of the 22 patients (77%) underwent the distal approach of Gelfoam SAE. The numbers from our study were too small to draw any conclusions about the possible effects or complications of embolization location. There are several limitations of this study. This is a retrospective study and is limited in its design. A type 2 statistical error cannot be ruled out. A written protocol was missing from our institution, which could guide the use of blood transfusion, surgical intervention, length of hospital stay, and post discharge instructions. Management algorithms of blunt splenic trauma among institutions should be compared with complications. The number of high-grade injuries from one institution needs to be examined and compared to other trauma centers. A multi-institutional trial to determine management of high-grade injuries is necessary and warranted to address the use of Gelfoam SAE. Long-term follow-up to evaluate splenic function was not conducted in this study. Ekeh et al. questioned the risk benefit of SAE on the immune system. Gelfoam SAE should also be evaluated for its effect on the immune system, splenic function, and need for postsplenectomy vaccination. Today's health-care environment requires physicians to provide care using research-based quality care and cost containment measures. Gelfoam SAE can be used for blunt splenic injury for intermediate ISS and splenic grade as it reduced hospital and ICU days. Criteria should be established to determine when Gelfoam embolization should be utilized, which may center on the institution and the abilities of the providers. There was no financial support or sponsorship for the research. Stassen NA, Bhullar I, Cheng JD, Crandall ML, Friese RS, Guillamondegui OD, et al. Selective nonoperative management of blunt splenic injury: An eastern association for the surgery of trauma practice management guideline. J Trauma Acute Care Surg 2012;73:S294-300. Marmery H, Shanmuganathan K, Mirvis SE, Richard H 3rd, Sliker C, Miller LA, et al. Correlation of multidetector CT findings with splenic arteriography and surgery: Prospective study in 392 patients. J Am Coll Surg 2008;206:685-93. Miller PR, Chang MC, Hoth JJ, Mowery NT, Hildreth AN, Martin RS, et al. Prospective trial of angiography and embolization for all grade III to V blunt splenic injuries: Nonoperative management success rate is significantly improved. J Am Coll Surg 2014;218:644-8. Frandon J, Rodiere M, Arvieux C, Vendrell A, Boussat B, Sengel C, et al. Blunt splenic injury: Are early adverse events related to trauma, nonoperative management, or surgery? Diagn Interv Radiol 2015;21:327-33. Wang W, Tam MD, Spain J, Quintini C. Gelfoam-assisted amplatzer vascular plug technique for rapid occlusion in proximal splenic artery embolization. AJR Am J Roentgenol 2013;200:677-81. Vaidya S, Tozer KR, Chen J. An overview of embolic agents. Semin Intervent Radiol 2008;25:204-15. Van der Cruyssen F, Manzelli A. Splenic artery embolization: Technically feasible but not necessarily advantageous. World J Emerg Surg 2016;11:47. Cocanour CS, Moore FA, Ware DN, Marvin RG, Clark JM, Duke JH, et al. Delayed complications of nonoperative management of blunt adult splenic trauma. Arch Surg 1998;133:619-24.
de Porto AP, Lammers AJ, Bennink RJ, ten Berge IJ, Speelman P, Hoekstra JB, et al. Assessment of splenic function. Eur J Clin Microbiol Infect Dis 2010;29:1465-73. Ekeh AP, Khalaf S, Ilyas S, Kauffman S, Walusimbi M, McCarthy MC, et al. Complications arising from splenic artery embolization: A review of an 11-year experience. Am J Surg 2013;205:250-4. Harbrecht BG, Ko SH, Watson GA, Forsythe RM, Rosengart MR, Peitzman AB, et al. Angiography for blunt splenic trauma does not improve the success rate of nonoperative management. J Trauma 2007;63:44-9. Schnüriger B, Inaba K, Konstantinidis A, Lustenberger T, Chan LS, Demetriades D, et al. Outcomes of proximal versus distal splenic artery embolization after trauma: A systematic review and meta-analysis. J Trauma 2011;70:252-60.